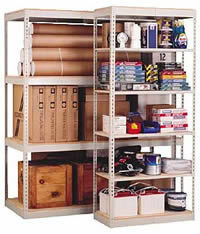 NationWide Shelving offers Clip Shelving for Industrial Storage Applications, which can save you time and space. H-Post, Wide Span System, RivetRite, Clip and other products make one full line! 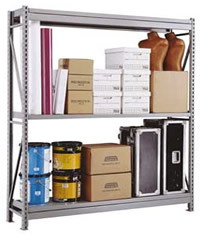 Clip Shelving offers the versatility of interchangeable components for all closed or open shelving systems, the option of assembling with bolts and nuts rather than clips, and a selection of front post styles. Clip Shelving is a simple storage unit. The unit has multiple shelves that are held together with 4 corner posts. The corner posts have many holes for various shelf heights. They can be adjusted every 1½ in. A clip is used to secure the shelves to the corner posts. Sway braces are added to the back and the sides for more steadiness. Shelving units come in a couple of types. Open Clip Shelving is the most versatile. This style provides a basic all-purpose storage. Closed Shelving is also available and the style is like open shelving but it has a metal back and side surrounding panels. The enclosed units provide spotlessness and organization for stored objects. The end panels can be modified with your own surface to match your design. Clip Shelving can be tailored to fit your needs. Post heights are available from 5 ft., 10 ft., 15 ft. and 22 ft.. 3 different posts are available to fit your needs. The Angle Post is used for seismic applications. Delta Post has a smooth front that looks great in Offices. Beaded Posts are for maximum weight capacities. 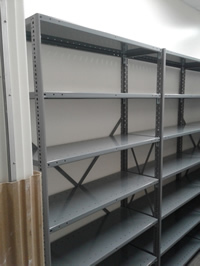 Many shelf widths are available, including 30 in., 36 in., 42 in., 48 in., and more! Shelf depths vary from 12 in., 15 in., 18 in., 24 in., 30 in., and 36 in. 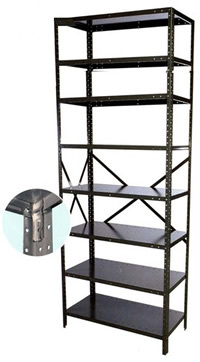 There are 6 different shelves varying for weight capacities. 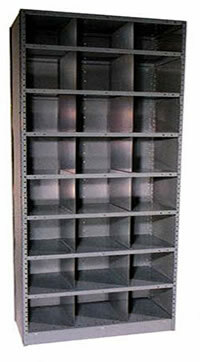 NationWide Shelving can help you customize a Clip Shelving unit for no additional cost. Clip shelving is a very multipurpose shelving unit that can be used to store nearly anything. Common stored items include boxes, food, files, CD's, binders, shoes, etc. 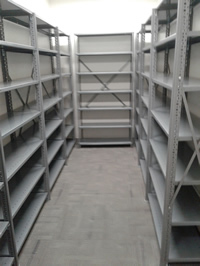 There’s open shelving and closed shelving to pick from, as well as many dimensions.